The same could be said for Bannon himself, the former Trump official and campaign strategist who architected the Muslim ban and has since attempted to organize the far-right movement in Europe. 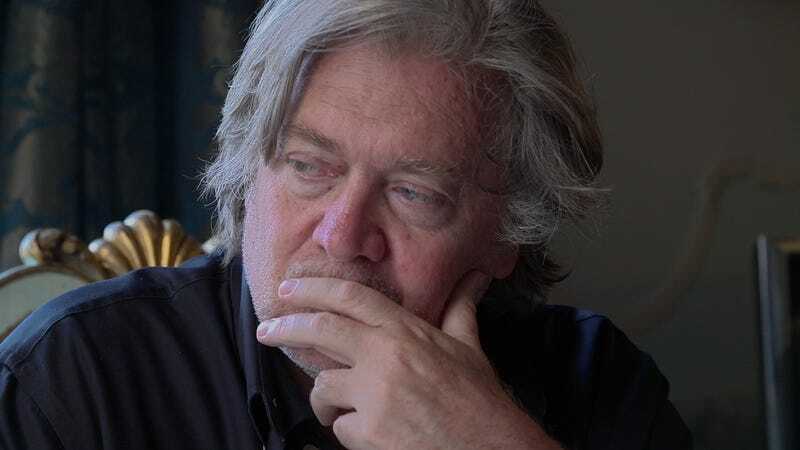 In The Brink, director Alison Klayman gained unprecedented access to Bannon and his allies for about a year leading up to the 2018 midterm elections, and it shows that Bannon is neither cartoonishly evil nor a mad genius. Instead, he is deflated to what he really is: a guy who has continually been given a platform for his bad ideas in coffee-fueled conference meetings with rich people, simply by virtue of his pedigree as a white man who attended Harvard Business School, worked at Goldman Sachs, and ran the Trump campaign. Documentary film is different than journalism and it’s different than an ideas festival where you put someone else on stage. I think that the verité approach as well makes it something that is a lot harder to manipulate as a subject. I was in a position that literally no other reporter could be in. He had absolutely no creative control in the film. I filmed literally hundreds of hours, and I had the luxury of taking my time, of watching how he operates, and I brought to the film some questions that were, I think, relevant for people beyond just, “Look, isn’t it cool? I got to hang out with Steve Bannon.” So for me, inviting that conversation to take place about what is the media’s responsibility when it comes to covering people and recognizing how eyes-open he and these movements are about essentially trying to legitimize themselves through coverage—that was an important thing to do. If I thought this movie was going to just be a way for his ideas to reach more people, I wouldn’t make it, and I don’t think that’s what the film is. I was constantly surprised by how self-aware he was able to be and had a good self-deprecating sense of humor. Yet a the same time, how often he seems to have a total lack of self-awareness and would say things that were revealing. I think he has big blind spots, also, in terms of vanity. He as a character is very complex.